Naipes Nacionales were designed by Manuel Bayardi and published by Clemente Jacques y Cia., Mexico in c.1940. 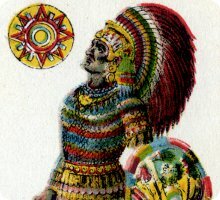 The designs are based on the clothing, decorations and weapons of the Aztec people after having been researched by Mr Bayardi in manuscripts and the National Museum. The suit symbols are the traditional Spanish ones: coins, clubs, cups & swords. The printing is by chromolithography in eight colours. Decks were issued as single decks (40 cards in a paper wrapper) and also in double boxed sets with matching back designs in blue and red. The back design features an Aztec calendar with four cups. Above: the magnificent 'Naipes Nacionales' designed by Manuel Bayardi and published by Clemente Jacques y Cia, Mexico c.1940 (click image to zoom). The name of the manufacturer appears on the Jacks of Cups and Clubs. 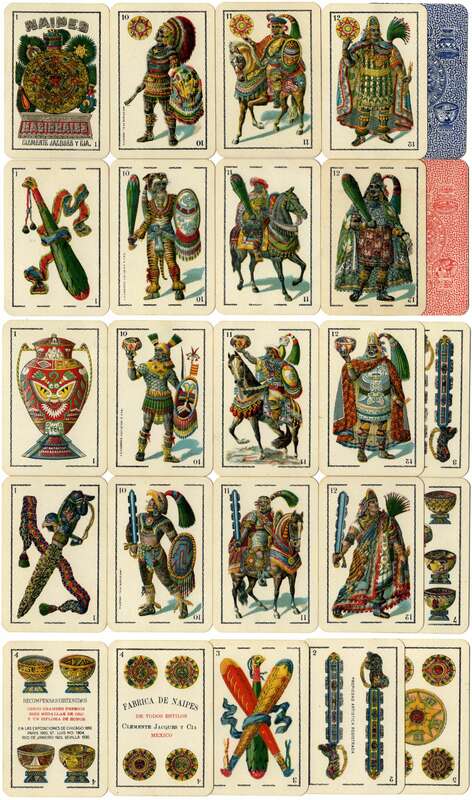 Although the suit symbols are traditional Spanish ones, the court cards are apparently based on persons from Aztec history but are not identified on the cards. Some anachronisms have crept in, as the Aztecs apparently did not ride on horseback although the native Mexican Indian people did acquire horses from the Spaniards. Manuel Bayardi is possibly the same person whose biography is shown here →. 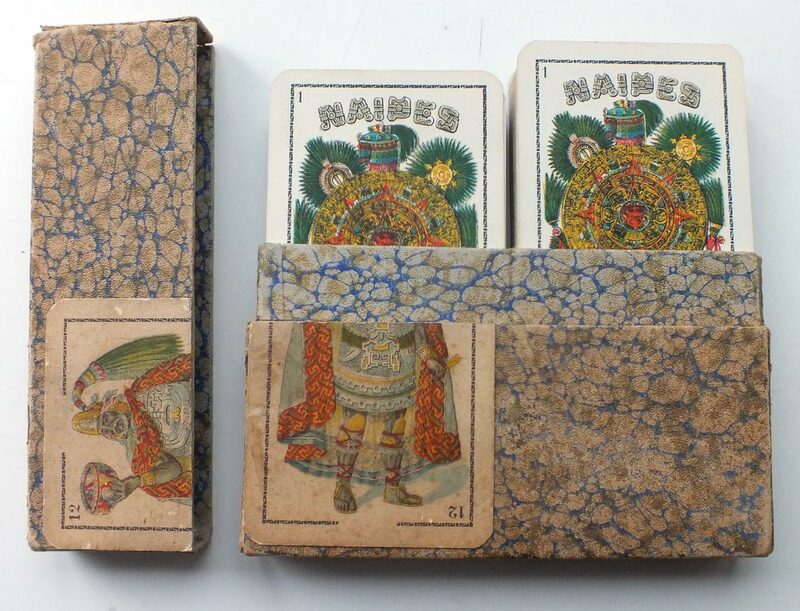 According to research carried out by Enrique García, the brand name Naipes Nacionales had been registered by Clemente Jacques y Cia as early as 1895 and again in 1912. The designs of the earlier editions appear to have been by a different artist and were more rudimentary than those shown here.